One of the favourite presents I have received was a huge canister of preserved lemons, presented as a gift for hosting a dinner party. Thought of mainly as a staple of Moroccan and Middle Eastern cuisine, preserved lemons have remarkable versatility, striking good looks, and a sublime flavour. Lemons pickled in lemon juice provide a citrus-on-steroids taste and aroma. When given the canister, I asked my friend—also named Peter—what it pairs well with. “Everything!” he said. Lemons add flavour to countless dishes. It’s telling that Martha Stewart said she missed fresh lemons most during her state-funded sequestration. Nothing beats the lemon-on-lemon flavour of preserved lemon, which goes well with almost anything and lasts for six months in the refrigerator. With perpetual thanks to Peter Troyer, here is a recipe to make preserved lemon and a few recommendations for use. The process is easy enough. One starts with a large sterilized jar or glass canister (I put the jars into a low oven after a thorough washing). 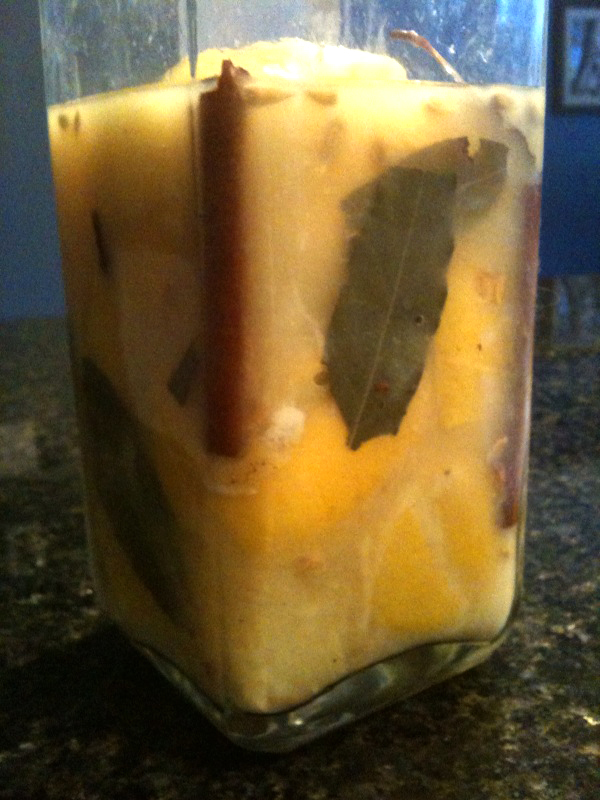 Into the vessel, place a large stick of cinnamon, some bay leaves, whole cloves, and peppercorns. Next prepare the lemons by first cutting off any stems. Splice each as though cutting into quarters, but leaving the fruit intact at the base. Now, rub kosher salt into the slits and finish by putting the whole lemon into the prepared jar. Be aggressive stuffing the lemons into the jar to extract juice. When no more lemons can be added, add fresh lemon juice to the jar until the lemons are fully covered. Finally, add a couple tablespoons more kosher salt. Now the rewards. One of the easiest uses is simply to place a whole lemon inside a chicken while roasting. It’s a perfect pairing with herbes de provence since lemon and lavender bring out the best in each other. The acidity makes poultry tender and juicy, and the flavour permeates wonderfully. If you’re the type to use pan juices, these will have a tangy flavour. In most cases, the inside pulp of the lemon is discarded and only the peel is used. Diced, it can be added to risotto, couscous, seafood chowder, and countless other dishes. It is the secret behind my favourite recipe for homemade hummus. Eventually the uses pile up: steaming mussels or fresh vegetables, savoury scones, and salad dressings. I’ve even tossed some into fruitcake. My uncle cuts cross-hatches into raw chicken breasts and then rubs them with diced preserved lemon. After marinating, he discards the lemon and coats the meat in Shake n’ Bake for a Moroccan meets American comfort food combination. I am in love with that last line! I think I should probably do something about my hangnails before I try this. I’m guessing you should buy more lemons than you think you will need? Also, do you rinse them before you use them (in addition to taking out the insides)? Amis knew what he was talking about re: imbibing. The line comes from a book called Everyday Drinking, which his son claims was only redeemable because it was not called (but likely should have been) Every Day Drinking. As for rinsing, I normally do not unless the dish that I am working with for some reason is already salted. Rinsing takes away so much of the flavour. Taking out the insides is not always necessary. A quarter lemon under a chicken breast is fine just out of the jar. Hangnails could be an issue. Also, yes, you will need more lemons that you think, mostly for the juice to cover up everything. I used about five pounds the last time I made a batch, but it was for a large canister designed for spaghetti. Also, the instructions are not clear that, while fermenting, it should be kept in the refrigerator. This sounds like a delightful jar to keep in the fridge. I’ll be watching for the next time lemons are on sale. And yes, Amis has got it exactly right!